The majority of people in modern day think of tarot cards as a mysterious way to tell the future. After this explanation you should be much more comfortable in how tarot cards can be used by a skilled intuitive to gain insight into a situation or provide answers to questions. Tarot cards are, in the end, simply a deck of picture cards. It is the intended use of the cards, and the intuitive skill of the person interpreting the cards, that determines their effectiveness. Many people write off the workings of tarot cards as an unexplainable or dark mystery. The history of the tarot is widely misunderstood by the majority of people. The use of tarot cards by occult practitioners has sullied their reputation as a positive, legitimate tool for psychics to provide more accurate readings for their clients. Others, with a more logic based mindset, project the western psychological concepts of the “unconscious mind” onto the workings of tarot cards. Carl Jung popularized the idea of the unconscious as the deepest level of universal memory and awareness that all humans share. Following this line of thought tarot cards could be considered just another tool (like psychotherapy or dream interpretation) to understand the unconscious mind. The symbols on the tarot cards most certainly relate to the universal archetypes explained in the writings of Carl Jung. However the reason tarot cards can be used as an effective tool by psychics goes beyond the ideas of the unconscious mind. We are, all of us, creating our own futures through our intentions and states of mind. The vast majority of people are not aware of this fact and end up creating their future reality unconsciously. In recent years the teachings of Abraham Hicks has helped popularize the concept of creating one’s own future. A skilled psychic sits down with their client with the intention of using the tarot cards as a tool in understanding the client. A psychic uses their intuitive skills in interpreting the sum total of the meaning of all the cards laid down in a reading. 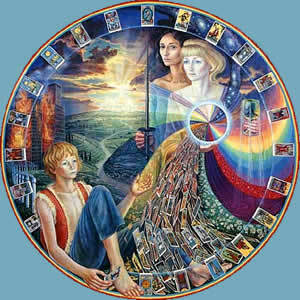 With this knowledge the psychic can help their client create a better future, one that will lead to greater happiness. A psychic’s intuitive ability is directly related to the degree in which their sixth chakra has been opened. For those not familiar with chakras, each of us has an energetic body that corresponds with our psychical body. There are seven major chakras (or energetic centers) that match with a location on the physical body. The sixth chakra affects a person’s intuition, among other things. As we are all advancing along our spiritual paths the obstructions in the chakras are gradually lessened and removed. Each person has different chakras open at different speeds. Psychics happen to have a more open chakra than most people. Through their intention and intuitive ability psychics utilize the universal meanings of the tarot cards to help their clients understand their current life, and situation, and create a better future reality.